More than 6,000 Scientologists and guests gathered to celebrate the dedication and opening of the new Church of Scientology of Rome in the Casalotti de Boccea district on October 24, 2009. 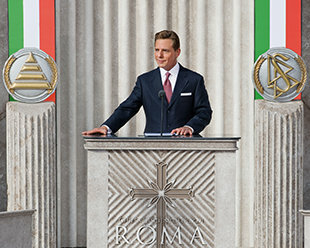 Mr. David Miscavige, Chairman of the Board of Religious Technology Center and ecclesiastical leader of the Scientology religion, presided over the dedication and opening of the new Church of Scientology of Rome. Mr. David Miscavige led the ribbon cutting to open the new Church of Scientology of Rome, joined by the Church’s Executive Director and dignitaries, marking the greatest expansion in 30 years of Scientology in Italy. The new Church of Scientology of Rome stands in the Casalotti di Boccea District, surrounded by 28 acres of parkland. The interior spaces of the 70,000-square-foot contemporary structure were re-designed to accommodate all parishioner services and activities. All are welcome to visit the new Church of Scientology of Rome, which is open seven days a week. Counseling and training services and community activities are available to anyone of any religious creed or belief. The Public Information Center, with self-guided tours of interactive multimedia displays, presents Scientology beliefs and practices, the life and legacy of Scientology Founder L. Ron Hubbard and global social betterment programs. The chapel in the new Church of Scientology of Rome is the setting for Sunday Services, Weddings, Naming Ceremonies, Graduations and other Scientology ceremonies. It is also available to the community for special occasions, workshops and meetings. The auditorium serves the parishioners of the Church of Scientology of Rome as well as the community for events, conventions and meetings. It may also be reconfigured for banquets, receptions and other special functions. The courtyard with its gardens for parishioners of the Church of Scientology of Rome and guests to enjoy. On October 24, 2009, the new Church of Scientology of Rome opened in the Casalotti di Boccea district of the Eternal City. More than 6,000 Scientologists and their guests came from across Italy and beyond to celebrate the dedication of this magnificent new Church in its 70,000-square-foot home on 28 acres of parkland. The new Church marks the largest expansion to date for Scientology in its 30-year history in Italy and will serve parishioners of Central Italy and other regions of the Mediterranean. Among those participating in the dedication of the new Scientology Church were Mr. Dino De Pasquale, Disaster Manager of the Civil Protection Agency; Professor Silvio Calzolari of the Theological Faculty at the Vatican University in Florence; Professor Luigi Berzano, Professor of Sociology of Religions at the University of Turin; and Ms. Laura Guercio, President of Legal Aid Worldwide. The new Church home is a contemporary building that has undergone extensive remodeling to accommodate all Scientology religious services, the many community activities of Church members, and introductory services for visitors. An expansive Public Information Center houses a permanent audiovisual exhibit containing more than 230 films covering the Church’s beliefs, practices and activities. Along with incisive descriptions of Scientology principles and information on the life and accomplishments of Scientology Founder L. Ron Hubbard, here is the definite introduction to all Church-sponsored social betterment programs to combat drug abuse, illiteracy, criminality, immorality and human rights violations. Central to the building is the 300-seat auditorium for Church and community events. The Church of Scientology of Rome will coordinate the social betterment programs of the Church in Central Italy. With two decades of experience in drug prevention, its “Say No to Drugs, Say Yes to Life” program provides proven, effective solutions to one of the most pressing problems in Italian society. “You owe every addict a drug-free life and every lost and hopeless soul the chance to discover Something Can Be Done About It.